While my blog post itself does not contain any sexual content, this book does. This is a review for a book that is meant for mature audiences, and therefore is unsuitable for minors. This book was provided to me for free by the publisher in exchange for an honest review. Thank you for also providing the press kit with the graphics and blurb. I'm a world famous tattoo artist with a six month waiting list. Everybody's begging me to put my ink on them. I'm the hottest s*** in L.A., and can get any girl I want. So the last thing I expect is for Ash Carter to walk into my shop and blow me off. Maybe it's because I've read enough of these misunderstood-dude-from-the-wrong-side-of-the-tracks stories that I wasn't particularly WOWed by this one. Don't get me wrong--it's got everything that I love about JDH, and I enjoyed reading it for sure. But not every book can be a favorite, right? So while I liked this one, ultimately, there are other JDH novels that stick out in my mind more. But again, that doesn't mean that this wasn't a fun reading experience :) I actually found myself way more intrigued by the tattoo shop than any other part of the story (including the romance part). I definitely came away from this book wanting a tattoo from Teo. Btw, I totally imagined him as being this super hot Asian-American guy until I found out that Teo was short for "Matteo." Alas, I am disappoint. I think that would've made the story more compelling for me, with that added dimension. Nonetheless, it's a fun, enjoyable "rediscovering long lost love" story, and I'm definitely glad I got a chance to read it. 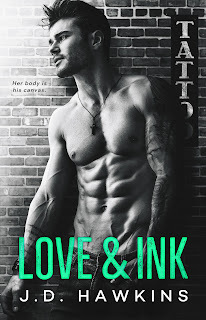 At the moment, Love & Ink is 99 cents (or free if you have Kindle Unlimited! ), so cuddle up with some blankets and heat yourself up with JDH's latest.